Take subway line 2 or 13 and get off at Dongzhimen Station. Use Exit G and walk northwards onto Xiangheyuan Road. Head eastwards along the road for 250 meters (270 yards) to take bus no. 936 from Dongzhimen Wai to Hefangkou Stop. 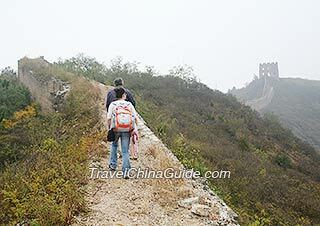 Find the way to the Hefangkou Village to start this independent Beijing tour to the Hefangkou Great Wall. Follow the ramparts westwards and you will pass by the mentioned spots one by one. After getting down from Shentangyu Watchtower, you may walk to the roadside of Guandi Village to take bus no. 39 to the terminal, Yujiayuan. Then head southwards for a few yards to catch bus 936 or 867 back to downtown area. Hefangkou is located 2.5 kilometers (1.5 miles) north of the Yanqi Lake in the Huairou District of Beijing. It was founded during the Northern Qi Dynasty (550 - 577) and rebuilt under the command of General Qi Jiguang in the Ming Dynasty (1368 - 1644). Occupying dangerous mountain terrains, this section only has ramparts on one side which was still enough to beat back attacks of enemies. Different from other cubic watchtowers, this one seems like being squashed and is in the shape of a matchbox. There are three arrow holes on the two wider sides and two holes on the other two walls. It refers to a giant piece of exposed rock on the mountain ranges. Seen from afar, it is just like a swimming fish with plants dividing its surface into several parts resembling fish scales, and hence the name. 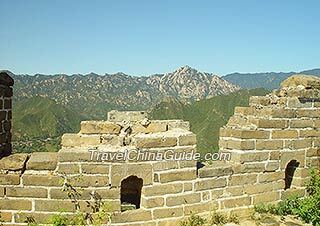 Although there is no rampart or watchtower, it is actually a natural barrier for being the steepest part of the whole Hefangkou Great Wall. There is no obvious stair on its smooth surface, so it usually requires backpackers to use both their hands and feet to climb to the top. It is a historical village which has accompanied Hefangkou Great Wall for over 600 years. Residences of the village were all newly-built courtyards following the architectural style during the Ming and Qing dynasties (1368 - 1911). 1. It is advised you arrive at Dongzhimen before 07:00 to take bus no. 936. The whole hiking will last for around 6 hours. After the trip, make sure you reach Guandi Village by 15:30 to catch bus no. 39. 2. You are suggested to set out this trip during spring (March - May) or autumn (September - November) when the weather is comfortable and the Great Wall looks more obvious among the sea of leaves. 3. It is suggested you wear a pair of hiking boots and take a climbing rope as there is seldom ramparts from the Back of Carp to Donggao Watchtower but only bare rocks. Besides, it is better not to wear shorts, short sleeves, or skirts to avoid getting scratched by branches.